"When the world's burning, you save what's most important...even if she'd rather die." When Bron, bodyguard to the Select, is jolted awake by an explosion, he quickly discovers that the entire city of Jalseion is in flames. Everywhere, people are dead, buildings collapsed, whole neighborhoods demolished. The scientific center of the world...burning to the ground. And the Select, those who rule through the magic in the wells? Where are they, and what has happened to the magic that powers the city? Bron banishes fear and uncertainty as he crosses the rubble with one goal: to find her. Children of the Wells - The Select's Bodyguard (Bron & Calea #1) has not been tagged yet. Help others find Children of the Wells - The Select's Bodyguard (Bron & Calea #1) by tagging it! 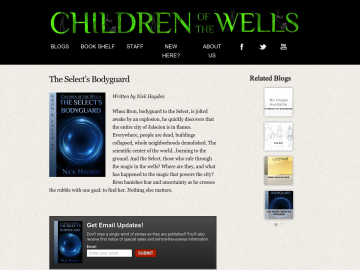 Children of the Wells - The Select's Bodyguard (Bron & Calea #1) has not been reviewed yet. Children of the Wells - The Select's Bodyguard (Bron & Calea #1) has not been recommended yet.